A silicon valley Mobile apps startup approached us with a unique project which involved auditing invoices, scanned or photographed by their customers. 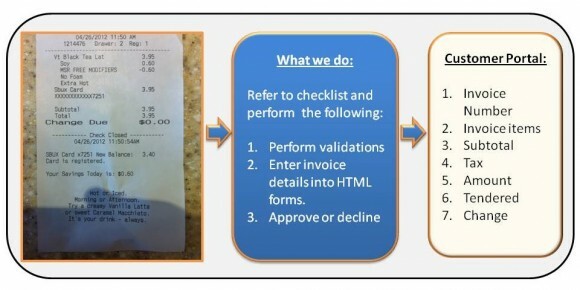 There was OCR (Optical Character Recognition) technology to scan most of the important fields, but still there was the requirement of a team to review these invoices and the recognized values has to be 100% correct. We quickly started off with one Data entry clerk and established a team of 5 to 10 as work picked up. Our UK Office ensured that the training is minimum and that the customer involvement is reduced to a minimum at the earliest by saving them time and money. We offered quality data entry clerks as well as flexibility to scale up the team at the shortest of notices.